Though music venues, vintage music, and cafes are popular places for various people, I've never seen all three rolled into one spot. That is not, until I stumbled upon the Bus Stop Music Cafe (henceforth referred to as the BSMC) in Pitman, NJ. I had heard from a friend that a new coffee location had arisen in Pitman and after a drive around, I deduced it to be the BSMC. On the outside, the venue looks fairly plain with a few outside tables. The interior is rather large, with records and CDs around the walls of the store, the cafe to the back right, and a large amount of seating in the front 3/5 of the store. Overall, a nice physical set-up for the three facets except for a fairly low ceiling for a music venue. My admiration fell short at the coffee. The coffee comes from a decent roaster in Deptford, NJ called Talk N' Coffee, specifically their Black Cat as it's the only coffee BSMC serves. Served up off a hot plate coffee brewer, the drip proved a tad stale though also noticeably sweet and smooth. To be frank, the espresso scared me. Even though the barista informed me that he was new to this, he then filled the portafilter with pre-ground Black Cat out of an old Maxwell House can, left it untamped, and then pulled. The espresso consequently smacked of cardboard and bitterness. I do not recall the tea. Granted BSMC is new to the cafe scene but it seems they have a lot of work to do with their coffee skills. Nonetheless, if you're looking for a local music scene, used music store and some fair coffee, then give the BSMC a try. 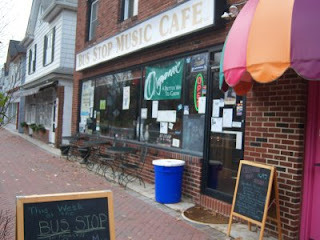 Have your heard, Bus Stop Music Cafe rec'd 5 STARS from the Courier Post in October for their Overall, Food, and Value. They're deemed as an Entertaining Eatery, the almost daily live music makes this place "a place to be". Their food is mostly organic but that's a side note, it's delicious! They also have a large tea menu for non-coffee-aholics, from The Republic of Tea. I have been to the BSMC many times, love their "Blink 182" their mocha cappucino & "Foo Fighters" their latte, their espresso being of premium quality and flavor. The house blend is a Dark Roast but they do offer other varieties. If you're ever in Pitman, the Bus Stop Music Cafe is well worth the stop! Very cool place, have been many times. Food is great, music is great. Prices are fair for what you get. My wife and I have always had the opposite espresso experience since we've been going there. The coffee is really good!